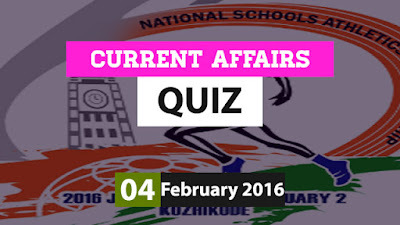 Hi Aspirants..Here is the Current Affairs Quiz for 4 February 2016 useful for all upcoming exams. 1) Which Indian was on 3 Feb 2016 appointed vice-president and chief investment officer of the newly-created Asian Infrastructure Investment Bank (AIIB)? 2) Hyderabad-based vaccines manufacturer ____ has recently announced a breakthrough in developing the world’s first Zika vaccine? 3) All-women taxicab service She-Taxi of which state on 3 February 2016 received the prestigious Chief Minister's Award for Innovation in Public Policy? 4) Which state has won the 61st National School Athletics championship 2016 which concluded in Kozhikode on 2 February 2016? 5) World Cancer Day (WCD) is observed every year on? 6) Who was on 4 Feb. 2016 appointed as first women head of Indian Cost Accounting Service? 7) Balram Jakhar who passed away in New Delhi recently was the former? 8) Mahatma Gandhi National Rural Employment Guarantee Act (MGNREGA), 2005 recently completed ___ years of implementation? 9) Alphabet Inc., the parent company of _____ has recently overtaken Apple as s most valuable company in the world? 10) Who was recently appointed as the first woman Director General of Sashastra Seema Bal (SSB)?